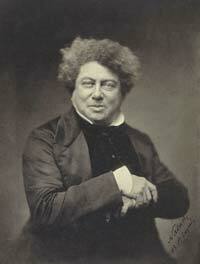 Alexandre Dumas was a French author whose best-known works are historically-set adventure stories. The most famous of these include The Three Musketeers and The Count of Monte Cristo, both of which have been translated into dozens of languages. The plentiful action and memorable characters in Dumas’ works have made them ideal for adaption to the big screen, with around 200 movies based on his writings having been produced. Dumas was born near Soissons on July 24, 1802. His background was remarkably mixed: his grandfather was of noble birth, but his grandmother was a black slave from Dominica. The family was poor after Alexandre’s father, who had served as a general during the French Revolution, died when the boy was only four years old. He did not excel in his studies, but his good handwriting allowed him to begin a career as a public notary. He quickly began to write, sometimes in collaboration with others, musical comedies and then plays centering on historical events. Moving to Paris, Dumas was employed by the Duke of Orleans, the future King Louis Philippe. He was an enthusiastic patron of the theater, writing several plays after being much influenced by Shakespeare’s works. He achieved some success with a play about Henry III (Henry III and His Courts), but the revolution which gripped France in 1830 forced him to take a political stance. The new king was unimpressed by his support for Lafayette, and Dumas was briefly forced into exile. He took this opportunity to write a number of travelogues about his time abroad. When he returned to the French capital, Dumas first wrote more historical plays, which numbered around 20 by 1850. By now he was also writing prose in considerable volume: The Three Musketeers appeared in 1844 and The Count of Monte Cristo appeared two years later. He was comfortable working either alone or in partnership with other writers, and a number of collaborators were engaged to assist him with working out the basic structure of his novels. Even without this help, Dumas was a hugely productive writer, with over 1,000 works being attributed to him in all. Although by the middle of the 19th century, Dumas was theoretically a wealthy man thanks to the enthusiastic reception his books received. However, he was an inveterate spender of money. He was especially profligate when it came to his many female admirers and the hangers-on who surrounded his estate. Dumas had a generous nature in keeping with his larger-than-life image, but his spending sometimes grew so large that it threatened to overtake even his substantial income. Dumas was a supporter of the 1848 Revolution, but he was forced into exile once again when Napoleon III came to power four years later. He went to Belgium where a diligent secretary managed to improve his financial position. Returning to Paris in 1853, Dumas founded an arts-based newspaper, Le Mousquetaire, which lasted for four years. After another failed attempt, he moved to Italy to curate Naples’ museums. By 1864, Dumas was once again in debt, to the extent that collectors were actively pursuing him for money. But he nevertheless continued to lavish gifts on the women in his life. He continued to write, but works such as Madame de Chamblay were of a noticeably lower standard than his earlier writings. Dumas died in December of 1870, having sunk deep into a poverty softened only by the presence of his two children.